This chocolate-covered vanilla ice cream delight, shaped like everyone’s favourite mouse, is the quintessential Walt Disney World treat. It’s so iconic that you can even find salt and pepper shakers, keychains, clothing and other souvenirs sporting the design! Happily, Mickey’s Premium Ice Cream Bar is available at all Disney parks and resort. Some people swear this is the best dessert on the planet. Why not find out for yourself? This warm, mouth-watering pineapple bread pudding is served with banana-caramel sauce, and topped with ice cream, for an unbeatable combination. You’ll only find it at ‘Ohana and Tambu Lounge, at the Polynesian Resort. We credit Epcot’s France Pavilion with instilling our love for all things macaron (not to be confused with “macaroon”, the sweet coconut treat which can also be found on property!). You’ll find an assortment of flavors of this delectable, soufflé-and-meringue-based treat at Les Halles Boulangerie-Patisserie, or try a macaron ice cream sandwich at L’Artisan des Glaces. While the iconic Beauty and the Beast dessert was previously only available to Be Our Guest diners celebrating a special event, it’s now available to all guests, in cupcake form! Spoiler for those who haven’t tried it: the “grey stuff” is a creamy cookies and cream mousse, with sprinkles, atop a chocolate cupcake. And yes, it really IS delicious! We discovered this treat years ago, and it’s become our go-to anytime snack while we’re in Disney World! It comes in too many flavors to mention (chocolate caramel, confetti, churro and African spice are just a few), but the cheddar flavor was our instant favorite. 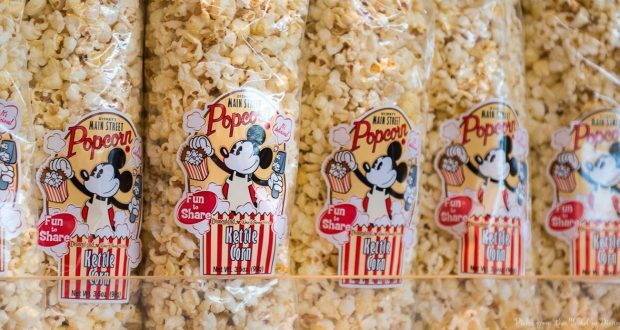 Luckily, you’ll find these portable popcorn bags throughout all the parks and resorts. We’ve never met an item we didn’t love at Karamell Kuche in Epcot’s Germany Pavilion. But the caramel pecan bar is the best of the best, with a shortbread cookie crust under a thick layer of gooey, chewy caramel, topped with pecans. It’s worth standing in line for, we promise! You’ll find this unusual winner at the Boardwalk Bakery. Peanut butter cream cheese meets chocolate glaze and chocolate shortbread, topped with candied bacon and a dollop of heavenly banana topping. What more could you ask for? Served piping hot and coated with delicious sugared cinnamon, you’ll definitely want to try both the almonds and the pecans! They’re crunchy, sweet, and delicious, and though you’ll need to look for them, they’re available at various snack carts throughout the parks. We admit it: there’s no way to go wrong with anything from Ghirardelli. But after lots of experimentation, our favorite is this beauty! It combines vanilla ice cream with a delectable brownie drowned in caramel sauce, sea salt and hot fudge. As if that’s not enough to make your mouth water, it’s finished with whipped cream and a cherry. Probably the best-loved Walt Disney World treat of all, this magical soft-serve ice cream is available in pineapple, vanilla or a mix of the two. You can also try it as a float, immersed in pineapple juice. Dole Whips are available at Magic Kingdom, Animal Kingdom, Polynesian Village Resort, and Pop Century Resort. Vegans, take note: the pineapple flavor is dairy-free.